I first heard about The Bread Lab from reading a New York Times article three years ago describing it as a "project to reinvent the most important food in history." It depicted Dr. Stephen Jones, the lab's founder, as looking like "a lovably geeky high school teacher," albeit one bent on nothing less than a revolution in how we think about bread. "What most people picture when they think of flour—that anonymous chalk-white powder from the supermarket—is anathema to Jones. 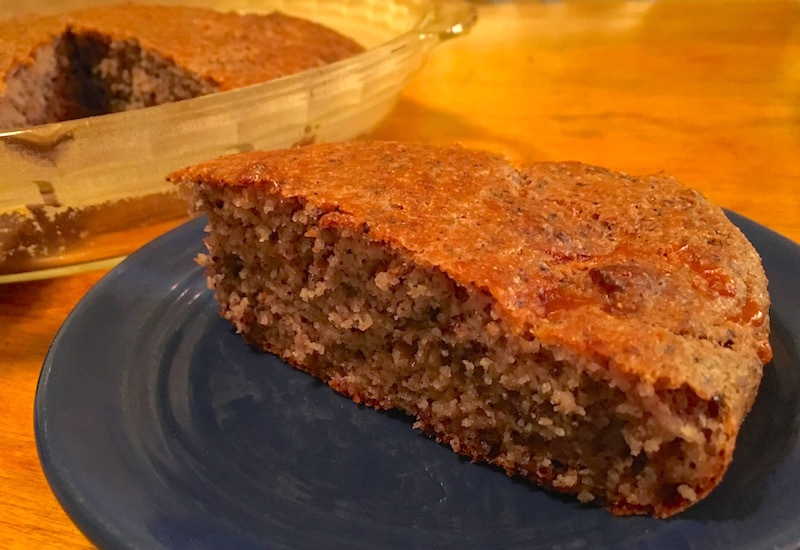 Before the advent of industrial agriculture, Americans enjoyed a wide range of regional flours milled from equally diverse wheats, which in turn could be used to make breads that were astonish­ingly flavorful and nutritious. For nearly a century, however, America has grown wheat tailored to an industrial system designed to produce nutrient-poor flour and insipid, spongy breads soaked in preservatives. For the sake of profit and expediency, we forfeited pleasure and health. The Bread Lab’s mission is to make regional grain farming viable once more, by creating entirely new kinds of wheat that unite the taste and wholesomeness of their ancestors with the robustness of their modern counterparts." The Bread Lab's Dr. Stephen Jones. 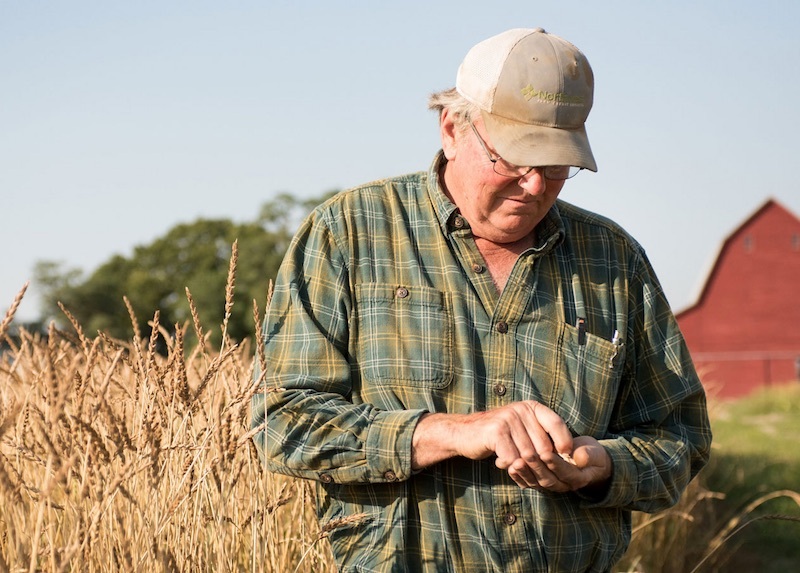 In the intervening years since that article was written, Jones's project, part of Washington State University's College of Agricultural, Human and Natural Resource Sciences, has achieved national and international recognition for breeding, testing and rejuvenating forgotten varieties of wheat, barley, buckwheat and rye. It's also helped improve the prospects of farmers in Washington's Skagit Valley, where Jones built his lab in order to be closer to the fields and the farmers who test the grains. "We’ve seen the addition of seven new businesses and about 200 new jobs because of the Bread Lab," said Patsy Martin, director of the Port of Skagit. "Farmers are making a profit off their crops and value is being added to the crops by new businesses. It’s our goal to have the number of businesses continue to grow and add more good jobs. A resilient agricultural economy will keep the Skagit Valley unique, special and viable into the future." Dave Hedlin of Hedlin Farms, a Bread Lab partner. 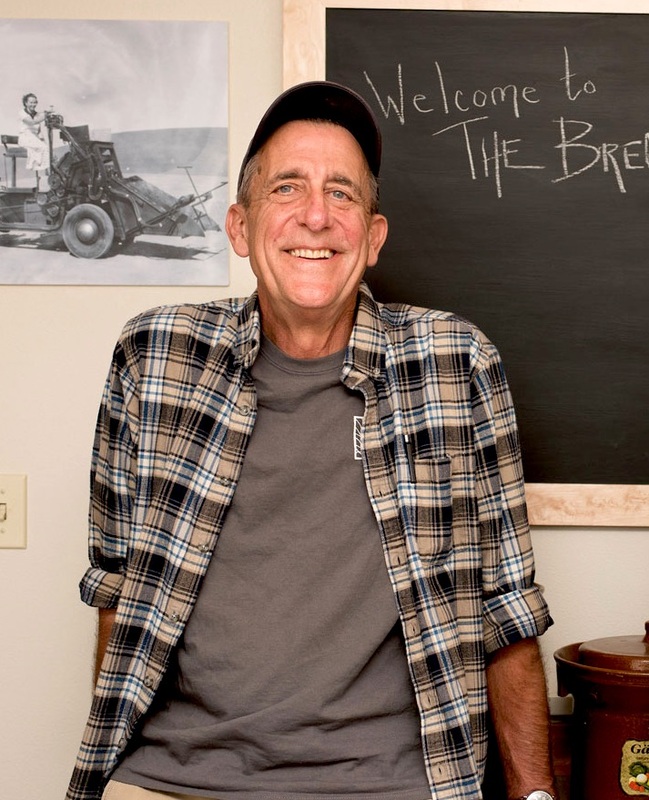 Today Clif Bar and Company, in association with King Arthur Flour, announced the funding of a $1.5 million endowment to enable the Bread Lab to continue its research breeding grains adapted to organic farming practices in perpetuity. Matthew Dillon, Clif Bar's senior director of agricultural policy and programs (profiled recently here), said, "Public sector land grant universities like Washington State have seen their funding for organic agricultural research cut year after year at the state and federal levels. 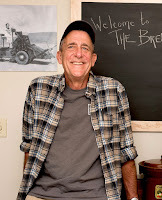 With the endowment, [Clif Bar and Company] is putting a stake in the ground for organic’s future because we believe the Bread Lab can improve the good that organic brings to farmers, consumers and the planet." Video and photos from Clif Bar. When I started writing Good Stuff NW almost twelve years ago, I had no agenda in mind. It was simply an exploration of the blog form as a useful tool in a marketing toolbox, marketing and advertising being my profession at the time. I wrote about this and that, convinced that no one but maybe my mom and a couple of friends would ever know about it (or care). In those early years I wrote about trips to Seattle or a visit to a restaurant, maybe throwing in a farmers' market shopping trip or two. Definitely recipes and pictures of our first Corgi, Rosey. Gradually the blog took on a life of its own, gaining a small audience and a couple of calls from editors asking if I was interested in writing for them. A column on farmers' markets, a profile here and there. But once in awhile I run across a truly remarkable spot, a hidden gem if you will, that deserves mention. 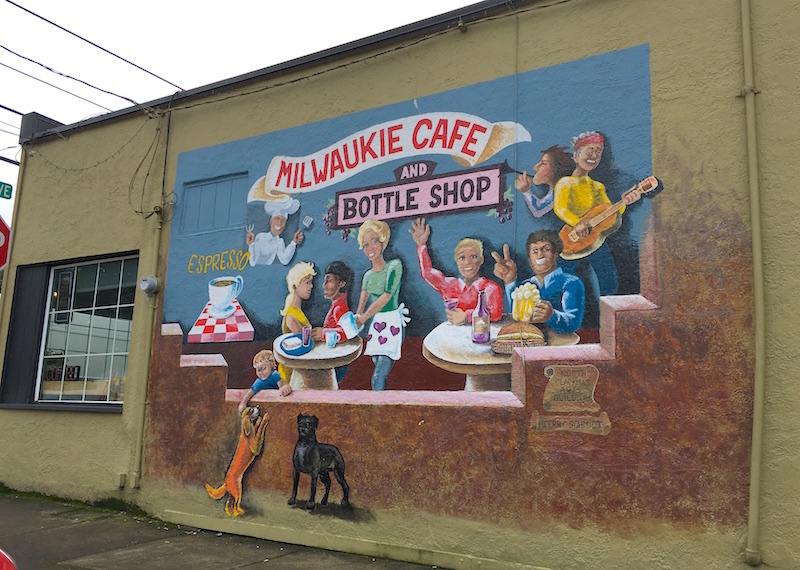 A friend and her husband recently moved to the Milwaukie area and, wanting to meet for coffee, she suggested the Milwaukie Cafe and Bottle Shop, located off the (or any) beaten track in the Ardenwald neighborhood east of Sellwood. The nondescript stucco building would be easy to miss were it not for the large, colorful mural adorning its side wall, attributed to the talents of Jerry Schmidt and the North Clackamas Arts Guild. Funky but sincere is one way to describe the ambience of the place, but a glance at the menu ran up against my initial hippie-homey impression. Polenta bowls? Brisket and collards? Homemade biscuits? I ordered a coffee—Water Avenue is their bean of choice, another "Hmmmm…" moment—and a biscuit with butter and honey. A plate soon arrived, the biscuit halved, the top aslant, brimming with butter, swimming in a pool of honey. 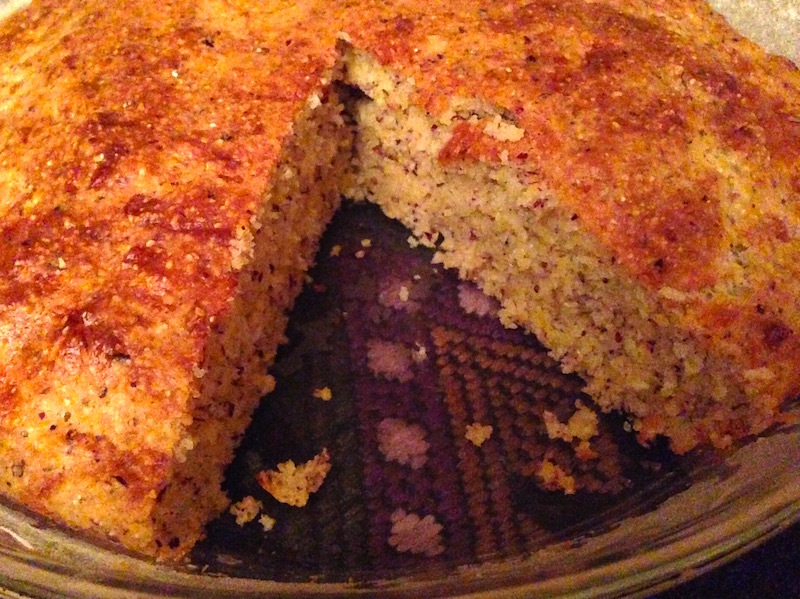 A bite through the crunchy crust, a light, buttery, not-too-salty crumb, and I was in. Checking the website for more info, I found it's the result of the collaboration of two Portland food names, Chauncey Roach and Shea Pirtle, both Nostrana alums with long resumés in local food. So, friends, before the word gets out, I'd get in while the getting's good. The location may keep folks from flocking in too quickly, but I'm pretty sure it'll hit the skillet soon. 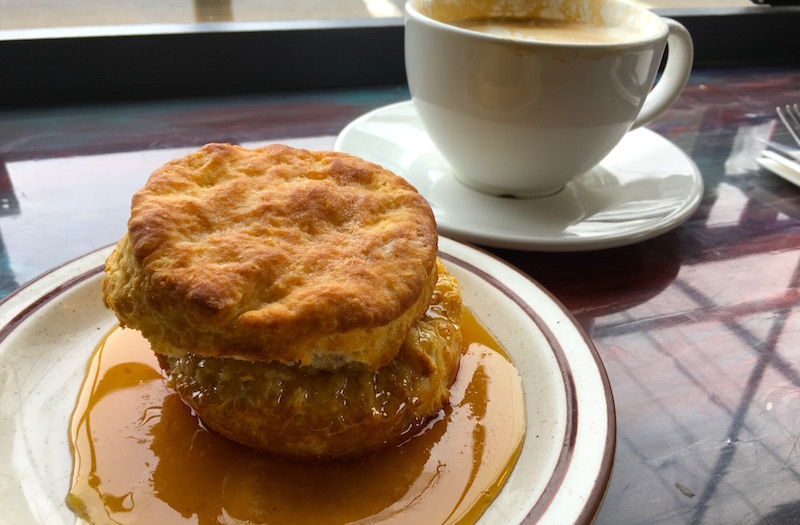 Contributor Jim Dixon of Real Good Food loves the Northwest, its people, its farms, its producers and its food, but he has a special fondness and respect for Southern foodways. Here he shares a favorite recipe for a Southern version of gravy. 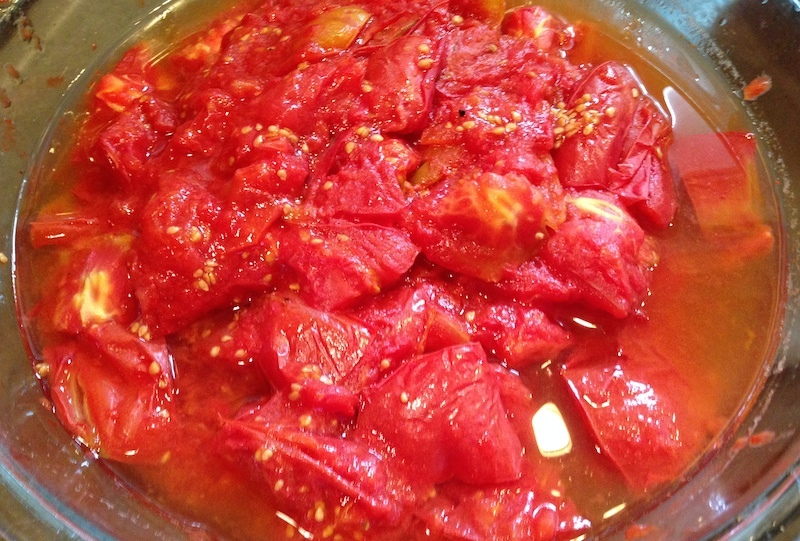 This is not Italian-American Sunday gravy, the long-cooked tomato sauce used for the week's pasta dishes. Southern tomato gravy has its roots in Appalachia, where the cold winters meant produce had to be put up when it was ready. Tomatoes in the garden meant canned tomatoes for the pantry. 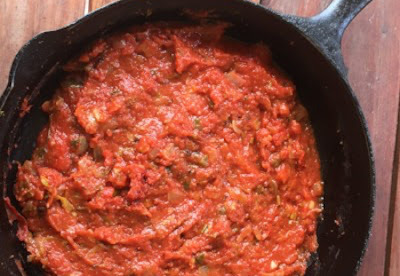 Ronni Lundy, one of the founders of the Southern Foodways Alliance and part of the hillbilly diaspora, says that "tomato gravy is a quick winter fix intended to remind you of the sharp tang of the summer garden." Love that there are lots of roasted tomatoes put away! And gravy, traditionally made with flour-thickened drippings from some kind of cooked meat, makes a little something extra from a few scraps, something that any cook can appreciate. Gravy adds flavor to simple, filling foods like rice, grits, biscuits or potatoes. While you could use just olive oil for this tomato gravy, some bacon grease will give it the real flavor of Appalachia. Tomato gravy was traditionally served with cornbread, rice, or biscuits, but it's also great with beans, especially red peas. Chop an onion and a couple of cloves of garlic and cook them with a good pinch of salt in a few tablespoons of bacon grease or extra virgin olive oil (or a mix of both) for a few minutes, preferably in a cast iron skillet. (Sometimes I'll also add a little chopped celery and some kind of pepper, often a seeded and chopped jalapeño.) Sprinkle about a tablespoon of flour into the skillet, stir it in and cook for another minute or two until it just begins to color. Add a 14-oz. can of crushed or diced tomatoes (I like Pomi brand) [You can also use a quart of those tomatoes you roasted this summer. - KB] and a small drizzle of cane syrup or sorghum syrup, if you have any. Add a healthy amount of freshly ground black pepper, more salt if needed, and simmer for about 15 minutes. It should be thick, like, well, gravy. Despite what you think, true winter in the Pacific Northwest, at least as far as most of the country is concerned, is a fleeting thing. 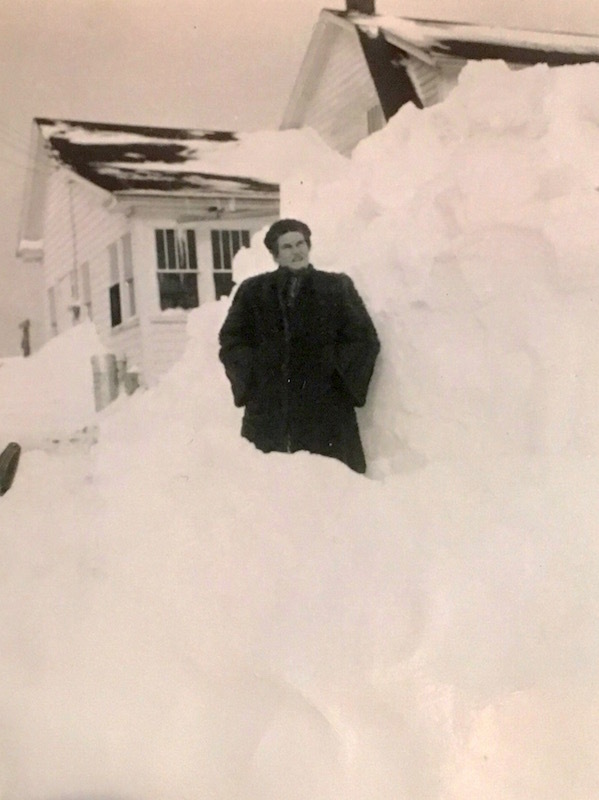 Yes, we may have a few freezes and snowstorms, but not like New England where snowplows—what are those, you might ask?—pile up banks of the stuff that last well into spring. And thank goodness we don't have the hurricanes, tornadoes and extreme flooding that many areas experience on a regular basis. My six-foot-tall mother-in-law next to a snowbank in northern Maine. Of course, with the unknowns brought on by climate change (and our denial of it), all of that could change in the future. But this year, at least according to produce guy and self-described Fruit Monkey, Josh Alsberg of Rubinette Produce, we can look forward to spring things like nettles, wild mushrooms and fiddleheads, plus herbs like sorrel and chervil, to start appearing as early as March, a mere eight weeks away. Until then? "Roots and citrus!" says Alsberg. Beets, yes, but don't waste those greens! By which he means colorful varieties of beets—red, gold and stripey Chioggia—as well as the knobby Gilfeather turnip, a half-rutabaga, half-turnip hybrid that is a favorite of local chefs, tracing its lineage to Gilfeather Farm in Wardsboro, Vermont. 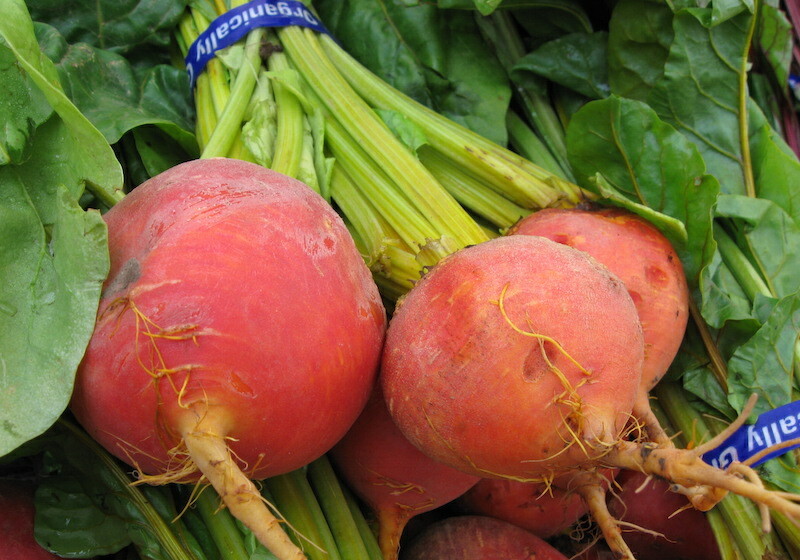 Rutabagas, turnips, celery root and storage potatoes will also be appearing on farmers' market tables over the next few weeks, as will onions, kohlrabi and locally grown white and purple daikon. Winter radishes will also be available, like the watermelon radishes from Black Locust Farm and black radishes from several farms, including Sauvie Island Organics. There are plenty of seasonal greens available, too. Think mustard greens, cabbages, beet greens, kale, collards, local chicories and gorgeous, deep red heads of radicchio. Gathering Together Farm and Groundwork Organics are growing Kalettes, purple-green, rapini-like florets that are a hybrid of kale and brussels sprouts, with a flavor that shines when roasted or stir-fried. 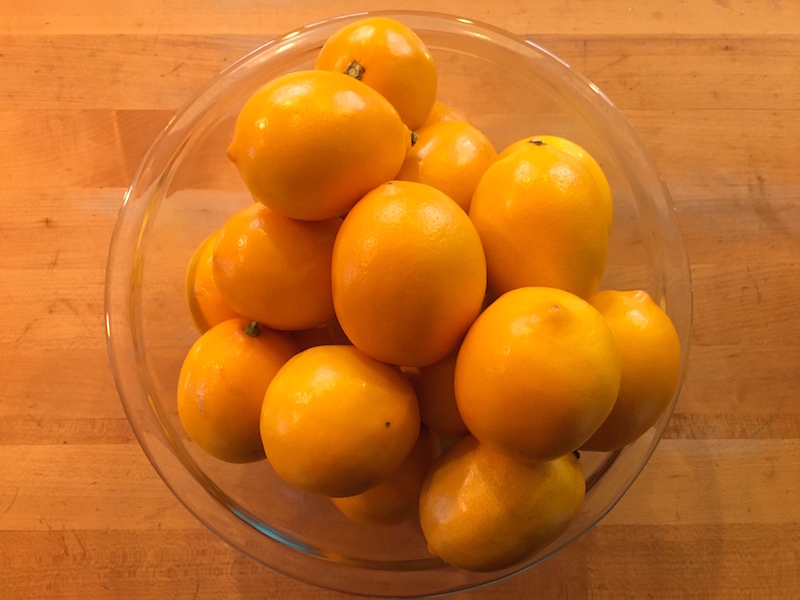 On the citrus front, I have big bowls of tangerines and Meyer lemons sitting on my counter right now, as fragrant as any store-bought potpourri or essential oils (and not as toxic to pets) and they're edible, to boot! The Meyer lemons will be used for my yearly batch of preserved lemons, to be parceled out in savory dishes, relishes and salads over the next few months, and if I can manage to spare a few, maybe some lemon sorbet. Alsberg is in hog heaven right now, gleeful at the prospect of citrus season. Several varieties of mandarin oranges and tangerines are beginning to appear, varieties like Shasta Gold, Murcott, Pixies and the teensy Kishu, with blood oranges, navel oranges and Cara Cara navel oranges rolling in now. He's also starting to see a rainbow of grapefruit on distributors' lists, and said that word on the street is that the white grapefruit called Mellow Gold is super juicy and sweeter than most. Pomegranates and kumquats have been in stores since Christmas, and we should be seeing local kiwis making an appearance soon. 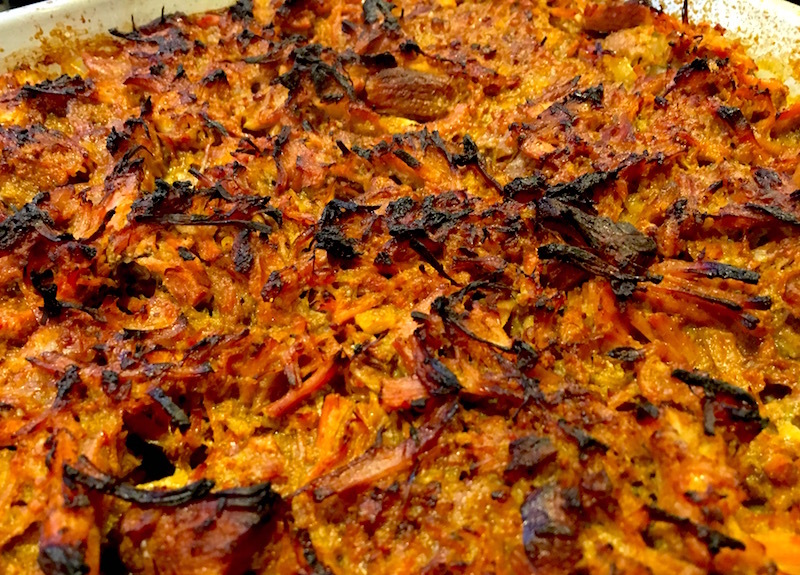 Kabocha squash is a personal fave. 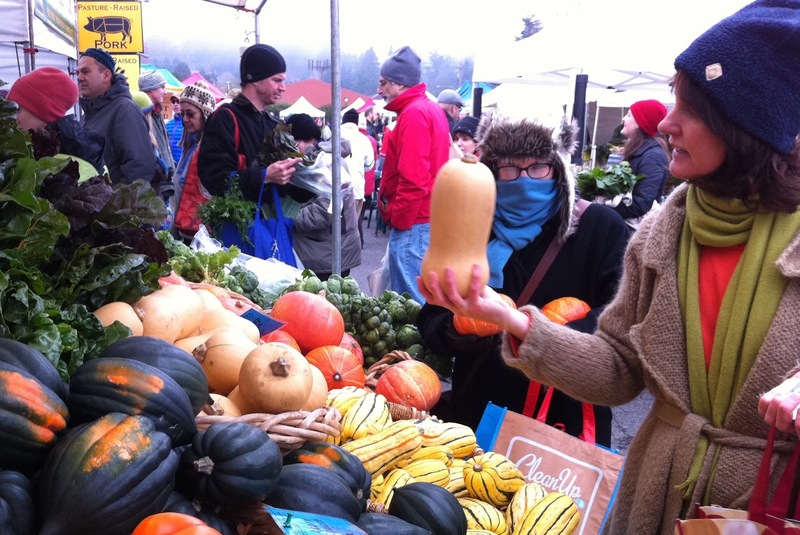 Winter squash is starting to clear out of his lists, but he said local growers should have plenty of kabocha, Kuri, butternut and acorn squash through mid-February. After that, though, he warns that the squash you see in stores will be from Mexico. "Enjoy them now" is his mantra. Look for recipes in my Squash Chronicles series. 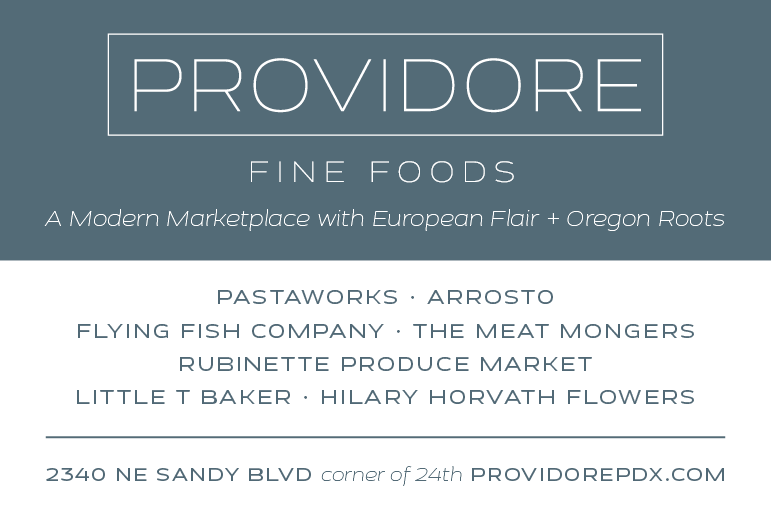 Rubinette Produce is a vendor inside Providore Fine Foods, an advertiser on this blog. Josh gives his advice quarterly on what's coming in from local farms and what we can expect to see on store shelves. 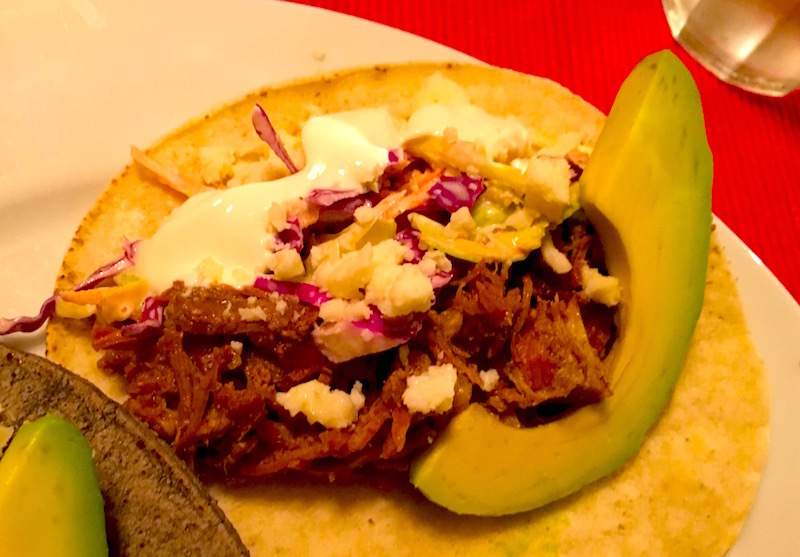 Carnitas, which means "little meats," is made by simmering chunks of pork with citrus and spices for several hours until it's tender and on the verge of falling apart. 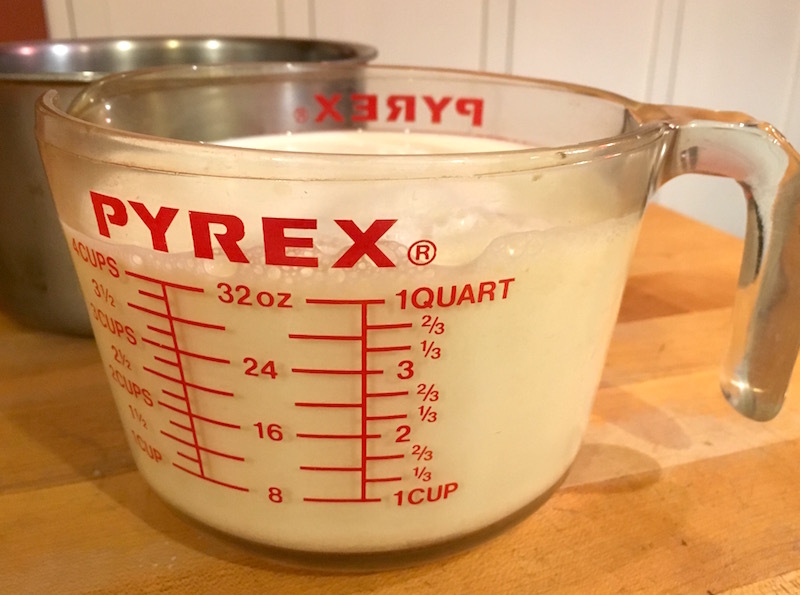 I had some whey left over from making ricotta, so I decided to use it for the braising liquid, since the acids in the whey would help to break down and tenderize the meat. The method I used then calls for shredding the meat, roasting it in the oven (or in a cast iron pan on the grill) until any remaining liquid evaporates and the meat is crispy. Warming the tortillas on a griddle is quick and easy, though I'm always tempted to pile them with heaps of fixin's, but exercising a teensy bit of restraint is worth the reward of the perfect bite, instead of bursting the taco or losing too much on your plate. Plus it means I can enjoy a few more of those longed-for tacos! Put all ingredients into large Dutch oven and bring to a boil. Reduce heat to simmer for 2-3 hours until meat is starting to fall apart and liquid is almost gone. If there is quite a bit of liquid left, remove the meat to a roasting pan, disposing of the orange peel and bay leaves. Bring the liquid in the pot to a boil and reduce until there is less than 1 cup remaining. While liquid reduces, heat oven to 450°. When liquid has reduced, pour over meat in roasting pan and place in oven for 20-30 minutes or until it starts to brown. Shred any remaining large pieces. 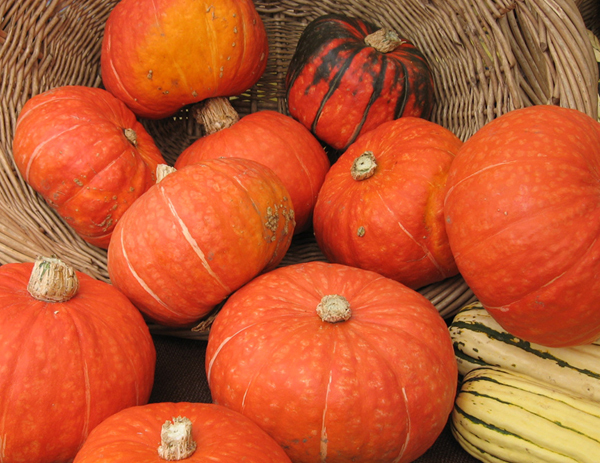 It's all squash, all the time here at Good Stuff NW…or so you might surmise from the preponderance of Oscar-worthy starring roles that winter squash has been playing in this series of posts. My passion has been aided and abetted by the series of mouthwatering videos like the one above, produced by Lane Selman of the Culinary Breeding Network and the inimitable Chef Tim Wastell. Squash season is still upon us, and you'll be finding these gorgeous orbs at local markets and greengrocers through February. Until then I'll be cramming as many of them into our dinner rotation as I can. I'm particularly intrigued by the miso butter glaze that Tim demonstrates in the video above, since I've sworn to start exploring the possibilities of the fermented umami-bomb of miso in the coming year with the help of locally produced Jorinji misos. 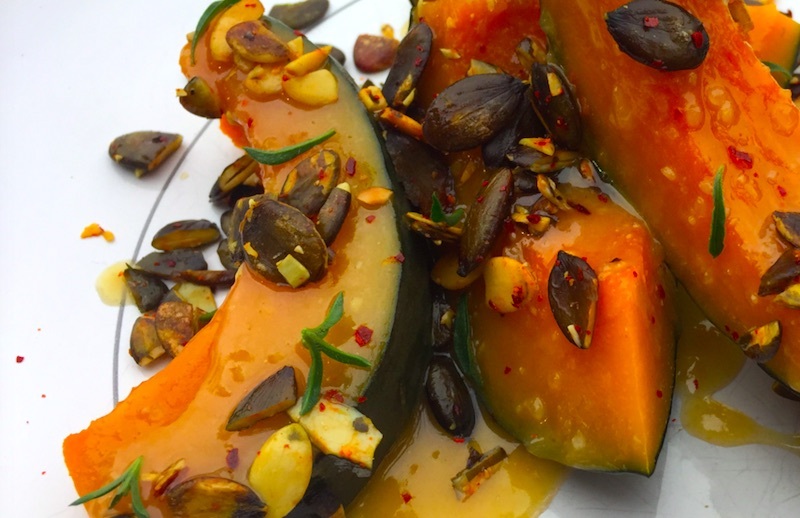 Get the recipe for the steamed kabocha glazed with white miso and maple above, and check out the rest of the Squash Chronicles. The video above shows what organic egg production looks like at one Oregon factory farm. Crowded into closed-in barns, with "outside access" limited to a roofed-in, screened, cement-floored patio with panels preventing the chickens from even seeing outside, is not what people imagine when they see the words "cage free" on the carton. And it's about to get a lot worse unless you act now. The demand from consumers for organic products has caused that segment of the grocery industry to explode. It's caught the attention of large agribusiness, which has been seeing its portion of the market starting to decline. 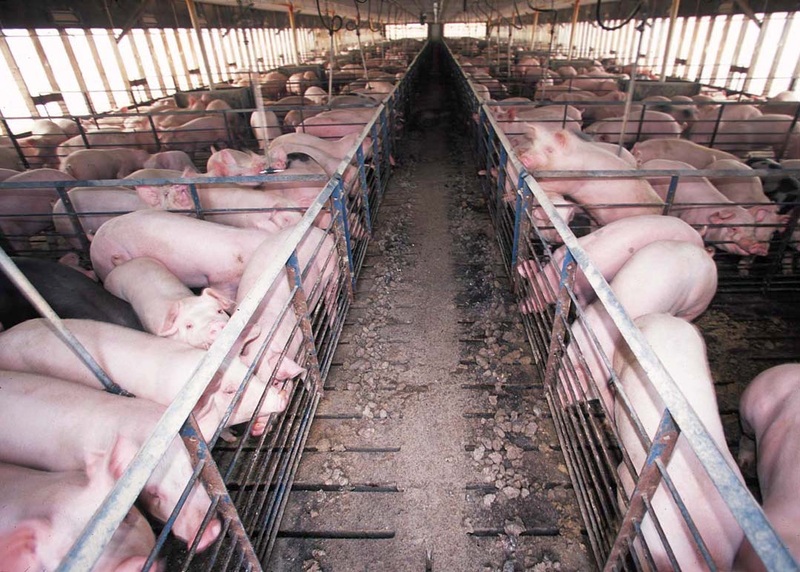 A new rule, carefully developed over the last decade, setting consistent and humane animal welfare standards for organic production, was about to go into effect when the current administration delayed its implementation. Over the holidays, USDA Secretary Sonny Perdue announced he was going to completely withdraw the new rule from consideration, a step that corporate agribusiness has been pushing for. The USDA's Agricultural Marketing Service (AMS) is accepting comments on its decision through Wednesday, January 17, so action is needed immediately. The Center for Food Safety has provided a simple form to submit a comment on this rule. It may sound alarmist, but the integrity of the organic label, including our health, and that of our communities and the environment, is at stake. I sincerely hope you consider signing it. I'm constantly asking myself: How could it have taken me so long to figure this stuff out? Currently it's my quest to duplicate the taste of the kimchi that I experienced eons ago as a college student in Korea, as well as to learn about fermentation. What a journey! So this last week, with friends coming for dinner, I decided to make a big tray of lasagne, something I've done a zillion times before. A few years ago I would have bought a container of ricotta and slathered it on the next-to-the-top layer to give a creamy, oozy richness to this Italian-American classic. But then my husband developed a problem with dairy, and with lactose-free commercial ricotta not readily available, I had to eschew that particular ingredient for several years. Then I read somewhere that it was super easy to make your own at home. D'oh! 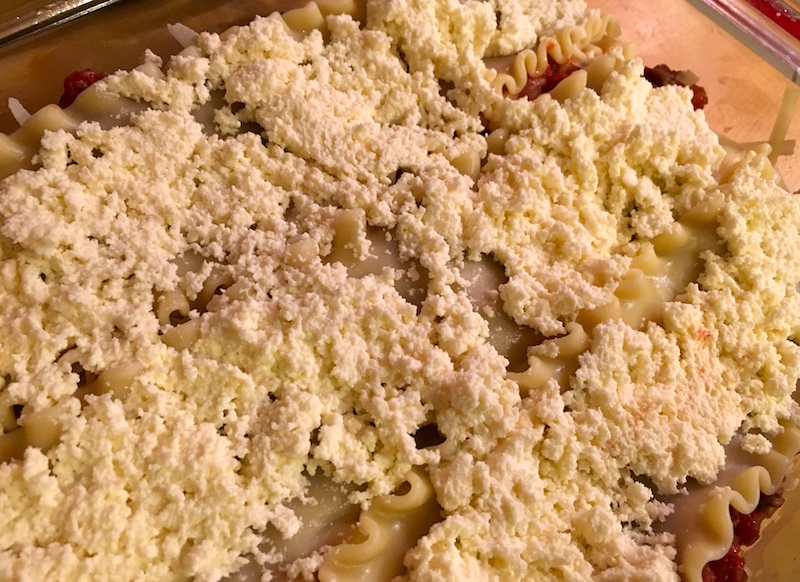 A layer in lasagne? Oh yeah! 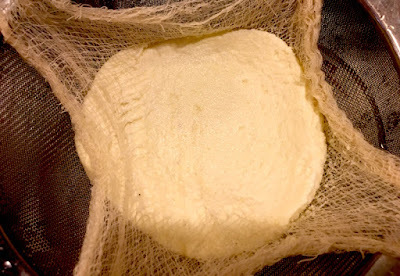 While, according to my friend, cookbood author Nancy Harmon-Jenkins, traditional Italian ricotta is made from the recooked whey left over from cheesemaking (ri-cotta means "recooked"), this method makes a delicious fresh cheese that's as good or better than most major store-bought brands. With the availability of lactose-free whole milk (thank you, Organic Valley), all it took was some googling and I had the basic idea. My first attempt used white vinegar as the curdling agent, which some recipes said had a neutral flavor. It was the right texture but I thought it gave the final product a funny flavor. Talking with some other cooks, almost to a person they recommended lemon juice instead. I tried it, fiddled with the timing a bit to get the texture I wanted and, like magic, the creamy softness was back in our lives. And it's so dang easy, I can guarantee that it's going to start showing up on crostini, mixed in pasta and dolloped on salads. 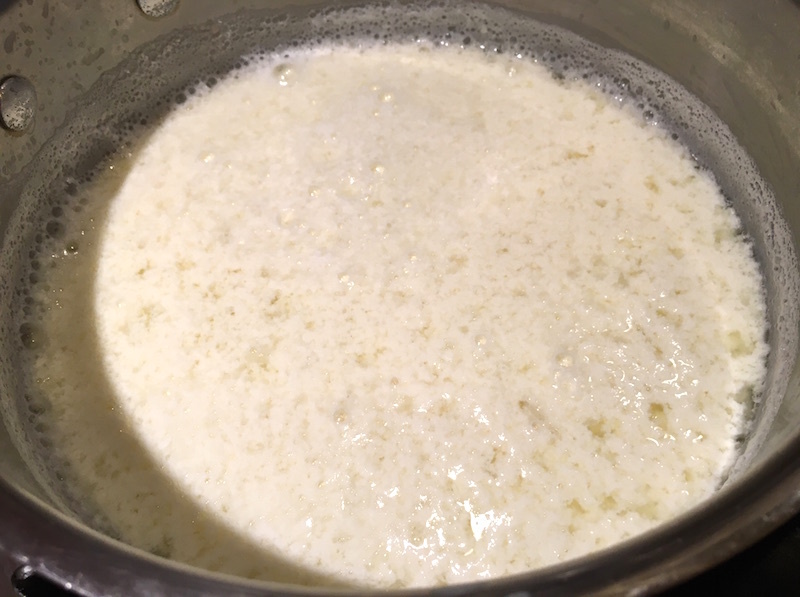 In a saucepan, heat milk over medium heat (you don’t want to heat it too quickly). Stirring occasionally to keep it from sticking and measuring often with an instant read thermometer, bring milk to 200°. When it reaches 200°, remove from heat and add lemon juice and salt. Stir a couple of times to combine and let it sit for 5 minutes. While it’s sitting, put cheesecloth in a fine mesh strainer over a bowl. Pour the contents of the pan into the lined strainer and drain, saving the watery whey. Depending on how dry you want your ricotta to be, let it sit for two to 20 minutes. A shorter time will give you creamier ricotta. Taste for salt and adjust. Note: Save the whey (the watery liquid left after draining) and feed it to your chickens or pigs. If you don't have livestock, you can feed it to your family, as well. It's very nutritious and is great added to soups, stews and sauces that benefit from a slight milkiness. (Think chowders, or a potato-leek soup.) One reader said she used the leftover whey to cook pork loin in the crock pot for pulled pork, which confirms what I'd read about the acids in the whey helping to break down meat. So I used it for making carnitas, and it worked fabulously. Try it! 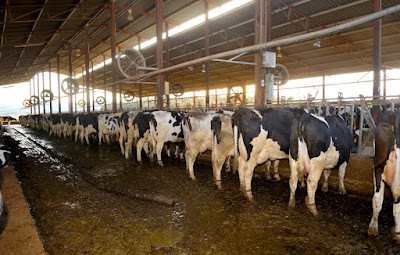 Wheeland asked to repost the story I wrote for Edible Portland about the mega-dairies that are flocking to Oregon, an issue facing many other small communities across the country. Of course I said yes, and you can read it here today. And, once you're there, please consider subscribing to this valuable news source. I do. Also, the timing is particularly appropriate because the 2018 session of the Oregon legislature is gearing up, and it's a good time to revisit the issue of the environmental risks from these factory farms, particularly to groundwater used for drinking and the toxic emissions that are fouling the air in the Eastern Columbia River Gorge. Look for more reports coming soon in the series Your Food, Your Legislature. Top photo of factory farm dairy barn, courtesy Center for Food Safety.